SMART Service Desk v11, has 11 processes complying with the latest ITIL® 2011 guidelines set by PinkVERIFY and the ITIL Software Scheme (ISS) from AXELOS for documentation. Pink Elephant (www.pinkelephant.com) is a global leader in ITIL certification and IT service management education, consulting and conferences. Pink Elephant is proud to be celebrating 20 years of ITIL experience - more than any other supplier. Gartner has placed SMART Service Desk consequently for 2 years i.e. 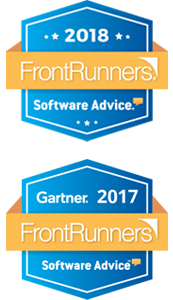 2017 & 2018 in the “FrontRunners” quadrant under the “Software Advice” category of leading IT Help Desk software. FrontRunners is a 100% data-driven assessment of the most capable and valuable products for small businesses. Software Advice is part of the Gartner Digital Markets network of sites, which also includes Capterra and GetApp. The FrontRunners quadrant is powered by Gartner methodology and based primarily on the user reviews of your software across Gartner Digital Market. Gartner, officially known as Gartner, Inc. is a global research and advisory firm providing insights, advice, and tools for leaders in IT, Finance, HR, Customer Service and Support, Legal and Compliance, Marketing, Sales, and Supply Chain functions across the world. Its headquarters are in Stamford, Connecticut, United States. 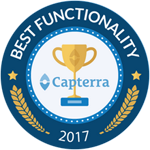 SMART Service Desk ITSM has been awarded Capterra's “Best Functionality” badge, based on reviews from Help Desk software users. There are several hundred products listed in Help Desk and therefore receiving this badge is a great accomplishment.